Day one at the Bangor Karakal Classic. 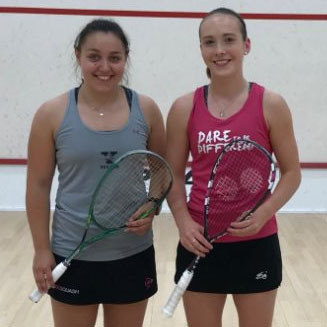 Day one was a great day of squash at the Bangor Karakal Classic, and a personal highlight for qualifier Lucy Beecroft as she knocked out the number 3 seed and world number 60 Lucy Turmel in a great 3-1 encounter which that seemed to have everything. Karakal's Ali Hemingway was the sole Welsh winner as the 7th seed came through in three games against wildcard entrant Ciara Richards. Ali will now play the giant killing Lucy Beecroft. All the other seeds made it safely through to the quarter finals, so we're looking forward to some more great matches today. Please visit the tournament website at BangorClassic.com, or follow the event on Twitter with #psabangor. Ana Margarita Quijano Victorious in Bogotá. 5th National Title for Tesni!